Pharmacologists generally express the ability of a drug to induce a response in terms of a dose-response (in vivo study) or concentration-response (in vitro study) curve (Figure 3). At low concentrations, the intensity of the response to the drug (D) is proportional to the concentration of drug, while at higher concentrations, the response does not change with a further increase in the drug concentration. The linear central part of the curve is expanded and extends throughout approximately a 10 fold range, making it easier to determine the concentration that produces a 50% effect, the half maximal response, referred to as ED50 (effective dose - 50%) or EC50 (effective concentration - 50%). These parameters are most frequently used to compare the potency of different drugs. The potency comparison is based on geometric mean EC50 values instead of arithmetic values . Figure 3. Concentration-response curve for the effects of norepinephrine in producing contraction of isolated rat vas deferens tissue preparation in vitro. Note that the X axis, which indicates the concentrations of norepinephrine added to the medium bathing the vas deferens, is in the log form. As a result, the central portion of the curve is linear. The ED50 for norepinephrine is 4.3 ^M. The maximum effect occurs at a concentration of ~ 100 ^M. drugs in producing effects in different tissues indicates whether the receptors mediating these effects are the same for each tissue. Thus, if the drug effects are mediated by a single receptor type in each tissue, then the relative order of potency of the drugs should be the same. For example, the relative order of potency of catecholamines differs in tracheal smooth muscle and heart of the guinea pig (Figure 4). It should be noted that depending upon the drug tested and the tissue in which the effect is studied, the slope of the dose-response curve can vary. Drugs that stimulate the rat uterus in vitro are known to produce extremely steep concentration-response curves. The slope of the dose-response curve may indicate whether the same or different receptor types mediate a given response. Thus, if the response produced by two drugs in the same tissue is mediated by the same receptor, then the slopes of their normalized dose-response curves should be parallel. On the other hand, different slopes of the dose-effect curves may indicate that different receptors may be involved . Figure 4. Concentration-response curves for three different P-adrenoceptor agonists on the tracheal strip and atria of the guinea pig. Numbers in the parentheses are the ED50 values for each agonist expressed in logarithmic form. The relative order of potencies of the agonists on the two receptor subtypes show obvious differences. 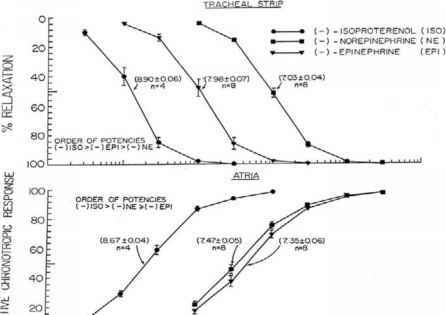 Whereas epinephrine is approximately 10 times more potent than norepinephrine in causing relaxation of tracheal strips, it is equal in potency to norepinephrine in causing contraction of the atria. 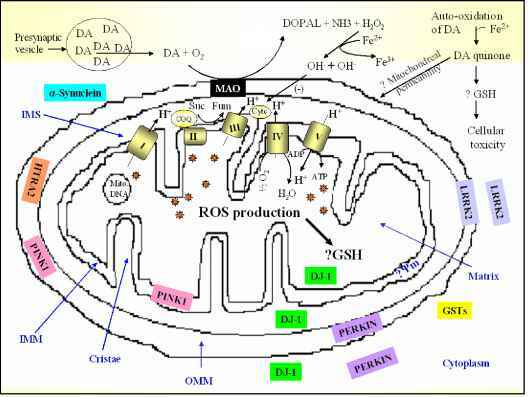 This is because two different receptor subtypes mediate the agonist effects, as postulated by Lands et al. . Relaxation of tracheal strips is mediated by the activation of p2 adrenoreceptors, while the positive chronotropic response of the atria is mediated by the activation of P! adrenoreceptors, data from Buckner and Patil  with permission from American Society for Pharmacology and Experimental Therapeutics. 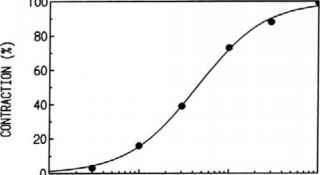 Another parameter of the dose response curve is the maximum effect of the drug. This is the largest effect that can be produced by the drug in a given tissue and is also called the ceiling effect. When there are spare receptors (discussed further below) and the number of receptors do not limit the response, the maximum response of the tissue to the drug may be limited by some other tissue event occurring after receptor occupation. The relative maximal responses of two agonists that act through the same type of receptor would reflect their receptor mediated intrinsic activities. In a given tissue, if one of these drugs produces a lower maximum effect than the other, it is termed a partial agonist. That is, the drug has a lower ability to initiate a biological response after binding to the receptor. Experimentally, the maximum effects of several agonists can be expressed as a percentage of the maximum effect produced by a full agonist.